Utley said yesterday that surgery has not even been discussed as an option. In fact, Utley said, he has played through worse pain during his career. If the Phillies were in the middle of the regular season instead of at the beginning of the Grapefruit League slate, he said he would be in the lineup. "I hope it's just a minor blip," Utley said. "I think we have the right people checking it out. I think the work ethic is going to be there in terms of trying to improve it. So in that aspect I think it's all good." Utley was derailed from another potential 7 WAR season in 2010 when thumb surgery wiped out his July and half of August. 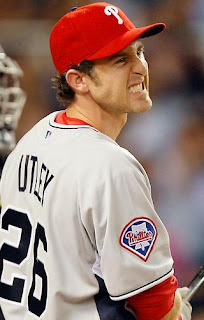 With any luck, rest and rehab will take care of this bout with tendinitis and Utley will have a healthy 2011. I'm not sure I'm emotionally stable enough to survive an injury plagued season or, god forbid, the beginning of the steep second baseman decline. Luckily, Dave Cameron doesn't seem to think Utley will fall to the same fate as Roberto Alomar or Ryne Sandberg. PECOTA projects a healthy Utley to be the best second baseman in baseball for 2011 and worth over a full win more than Robinson Cano (4.7-3.4). But 40 points of OBP and a run's worth of defense will do that. Even with a clean bill of health, my championing of an Utley MVP seems almost futile now. As much as it pains me to say, it might be time to turn my lack-of-MVP-consideration fascination to Ryan Zimmerman. Chase always gives you 110%. He plays so hard that his body doesn't have a chance to catch up. Phillies Manager Charlie Manuel should rest him more often, but Chase fights him on it. We'll see him play this year just as hard and don't give up on that MVP season. I saw him give 107% one game, so, no, he doesn't always give 110%.